The Collie hails from Scotland and is believed to be descended from dogs which accompanied Roman invaders and then interbred with hard-working Scottish herding dogs. Some historians believe the name Collie comes from the name Colley, the Scottish black-faced sheep they guarded; however, another theory is that Collies were originally black in color and the word “Col” is the Anglo-Saxon word for black. Original Collies were smaller in size than they are today, and their herding ability was valued more highly than their looks, but because the Collie was so beautiful, it wasn’t long before they were shown and bred for their good looks rather than their herding ability. When Queen Victoria visited Scotland in 1860, she fell in love with the Collie and brought a few back with her to England, making them extremely popular. They were first brought to the United States in 1879. Later, the 1950s television series Lassie brought renewed interest in the Collie, and their popularity soared once again. The fictional account of Lassie isn’t too far from the truth. The real-life Collie is extremely intelligent and is known for his uncanny ability to know when something is wrong. True stories abound about this breed coming to the rescue of people and also enduring incredible hardships to be with them. In fact, a Collie named “Bobbie” traveled 2,000 miles to find his people after being lost while on a family vacation. They love their family and want to be with them all the time. Collies are great with children. They take special interest in their little charges, often protectively watching over them. They have been known to rescue children and adults from cars, snakes, and fires. Some words used to describe a Collie are affectionate, loyal, easygoing, intelligent and devoted. They need daily walks and love to play with everyone. The Collie makes a wonderful family dog as it is so sweet, friendly and gentle. Collies usually weigh between 48 to 70 pounds and stand approximately 22 to 24 inches tall. They are medium in size and have a graceful build. The Collie comes in two distinct looks, the full coat, which is known as the rough Collie, and the short coat, which is known as the smooth Collie. 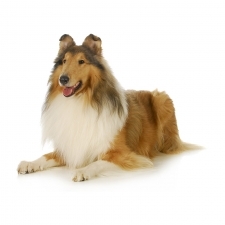 The rough Collie has long, flowing hair as opposed to the smooth Collie. Their colors range from sable and white, tri-color, and blue merle. The Rough Collie is much more popular in the United States than the Smooth Collie. However, the smooth Collie is more popular in Great Britain. They are the same dog, just with different coats and are judged by the same standards in the show ring. Some of the Collie’s talents include herding, search and rescue, guiding the blind, acting in movies, and watchdog.